In the wake of the horrific Peshawar school attack that killed 141 people, many of whom were children, the international community rallied against the attackers. What remained unexplored were the factors that led to the attack to begin with. What were the motivations behind the attack, and what can we learn from them in order to prevent further calamities? In the same way the rise of the ISIS and the atrocities committed by them, most recently the mass killing of more than 150 women, is something that once again shocked the world, but these groups have not emerged within a political vacuum. Surely when discussing the war on terror, and preventing such attacks from taking place, the way that the history of these organisations affects their present realities should be explored. Additionally, in the Western context, there needs to be an analysis of the factors that contribute to the radicalisation of the youth. Is it merely the cash rewards that ISIS is offering, or are there more complex factors at play, and if so, why are they not being considered in popular discourse? 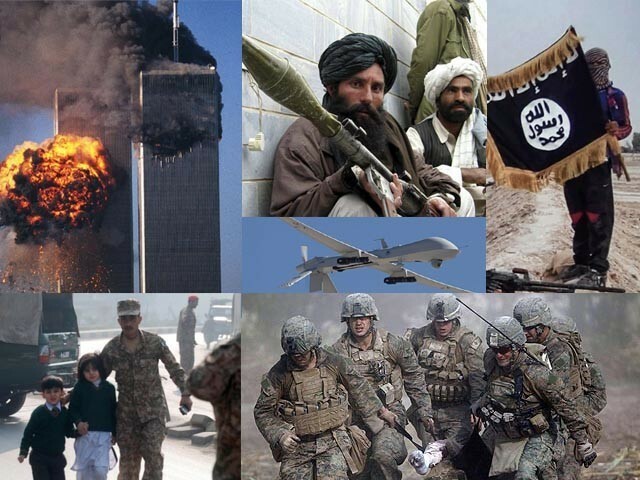 The War on Terror finds its foundations in the Iraq war of 2003 that led us in hot pursuit of ‘weapons of mass destruction’ that never manifested. Despite this well-known fact, why are we still waging an endless war? And more importantly, what is this mythical ‘terror’ that is being fought? How can any war be successful if not waged against a tangible reality, but an ideology, an emotion that is only perpetuated by further acts of violence? Since 2001, a series of conflicts have ensued in the quest to end ‘terror’, but surely by killing civilians ‘terror’ is being transposed from our realities onto theirs? In the years after 9/11, the Western world has led nations into armed conflict with nations within the Muslim world, and the wider political repercussions are made almost entirely invisible. The invasion of Iraq in 2003 was fashioned as the war to end ‘terror’, but in the 11 years of fighting, the conflict does not seem any closer to an end. The new threat of ISIS had led America to send more troops into Iraq in order to stamp out the ‘Islamic’ state. But, where did ISIS come from? And what is providing the momentum for the movement? It seems obvious that the momentum for such movements across the globe stems from the ground realities of these nations. The civilian deaths in Iraq since the onset of the war has totalled over 133,000, which has undoubtedly aided the rise of ISIS by giving the group a cause to oppose and a supply of disenfranchised civilians who have become collateral damage during years of violence. The political factors that contributed to the rise of ISIS are rarely discussed within popular understandings of the conflict. In 2006, Iraq witnessed elections and the victory of Nouri al-Maliki, a member of the Islamic Dawa Party, a clandestine organisation that aimed to resist Saddam’s leadership. Almost simultaneously ISIS gained greater power within the country, largely due to the US backed breakdown of the Iraqi army. This meant that thousands of former armed military personnel were left marginalised within the new state structure, largely due to strategic political manoeuvring. Furthermore, during talks between the US and Iranian officials that took place in Vienna on June 16, 2014, both states agreed to work together to halt ISIS momentum, but the US stressed that there would be no military coordination. The lack of coordination between geopolitical opponents once again strengthened ISIS, and the US’s role is ignored with all focus being placed on the charismatic leaders the organisations are said to have. The factors that have led to the political rise of ISIS are ignored in popular media, which instead proliferates the notion that ISIS has manifested from a vacuum fuelled by an archaic belief system that has subsequently propelled Muslims in the Western world within a matrix of preconceived notions of both themselves and their identity. Coupled with biased media reporting that ignores the Islamaphobic attacks that take place against Muslims, such as the woman who was doused in beer, and the eight fold increase in attacks on Muslims after the brutal killing of Lee Rigby. The image that is being projected by the West, not only creates a skewed perception of Muslims, but more importantly it creates a distorted image of ‘the war on terror’ as a war fuelled by the actions of fanatical Muslims, with no agency from larger political entities. It can also be argued that the marginalisation of Muslims (a Muslim man is 74% less likely to be employed than any other group) is a contributing factor in the increased number of ‘home-grown’ terrorists, mainly youths, abandoning their homes and joining ISIS fighters. Yet, despite the increase in violence against Muslims, and fear mongering by the media, the ‘terror’ that individuals feel in the West that may contribute to their decisions to join extremists groups is once again made invisible. Terror is ‘their’ game, and ‘we’ need to protect ourselves from it. Interestingly, what has been forgotten is the US’s role in creating the ‘terror’ that stems from al Qaeda and the Taliban to begin with. Osama bin Laden was and remained a member of the exclusive White’s Club on St James street, where David Cameron was a member, and Prince Charles had his stag do before marrying Princess Diana, after the attacks on New York in 2001. The war against Osama Bin Laden and the Taliban led to the deaths of over 21,000 Afghans, and added to the cyclical violence that has ensued since. Selig Harrison has noted CIA involvement in creating terrorist organisations in order to destabilise Soviet control in Afghanistan, a fact that is now once again made invisible in popular discourse. Even more interestingly, a report by US Central Intelligence Agency (CIA) conducted in 2009 states that the US drone policy has negative effects on counter insurgency, including increasing support for insurgents themselves. Despite this however, the Obama regime has increased its usage of drone strikes in Pakistan killing over 2,400 civilians thus far. The number of deaths for Pakistan increases dramatically when totalled with the army who have lost over 15,000 soldiers as well as greater civilian casualties making Pakistan’s death toll over 50,000 since 2001. Pakistan is depicted as rearing terrorists for its strategic purposes, a fact that gave the nation, and the world, a brutal tragedy on December 16th in the form of the attacks on the military school in Peshawar. The attackers made the argument that they aimed to kill a generation of military that would go on to kill them. Violence once again becomes cyclical, which is further evident in Pakistani government’s response to the attacks with lifting the death penalty for terror suspects. Once again perpetuating violence, which is not supported by greater political strategies that target the root causes of radicalisation. What has become evident through these acts of ‘terror’ is the fact that the war on terror has made the terrorists see a new enemy, one that is home grown. The Taliban in Pakistan perceive the Pakistani army as agents of the West, and seek to destroy them. Youth in the western world perceive their home governments as complicit in the violence being waged against them in the West, their identities in the media, and their co-religionists across the world, and therefore join fundamentalist groups in the quest to preserve an ill formed and inaccurate ‘Muslim’ identity. In the global war on ‘terror’ each act of violence is creating ‘terror’ which is then retaliated, but the picture we are shown is merely half a reality. US troops are still bombing Iraq and drones are still falling on Pakistan with more civilians dying than ‘terrorists’. In the West the marginalisation of Muslims in society, and them being vilified by the media is not seen as a contributing factor in the radicalisation of youth. Our governments are after all acting to protect ‘our’ safety, and we are being saved from ‘terror’. But, if through this we are creating a by-product that will hinder our safety and the lives of thousands across the globe, are we really winning? How can we fight a war that has no tangible enemy? When will it end? And more importantly, if these wars are being waged in the name of ‘our’ safety, are we then not equally to blame when they fail? Pakistan trained around 25-35000 kashmiri Terrorist..Indian army killed those 35000+ terrorist and These 35000 terrorist killed around 20000+ civilains in bombings and all plus due to fight between terrorist and Indian army some 15000+ civilians in kashmir had been killed…So to sum it all…pakistan is directly responsible for around 70000 killing of innocent people…Just waiting for the judgement day now for pakistan. I would like to state that unless and until you realize the fadct that there is something wrong with the extremist mindset of some of today’s muslims you will get no where. Do you think that if the “WEST” does not “meddle” you will live in peace? What of the extremist mullahs and the extremist preachers. A word to the wise. Scorpions will sting even if you don’t give them a reason to sting. As long as you do not root out extremism , more and more muslim youngsters will be radicalized and terror outfits will continue to spill blood. Ofcourse, this terrorism is not a fight against Pakistan military only; it is a fight against the state, as people who have lost their live in the hands of these terrorists are mostly local citizens. Therefore, army enforced measures cannot be the solution for this problem. To tackle this complex problem we will have to address the root causes that give rise to terrorist mindset. And this sure cannot be done by further curbing the rights of fair trials, on the basis of mere suspicion, as the newly established military courts would do. The major problem here is the lack of capacity building of law enforcement agencies and the absence of security that should be provided to witnesses and judges in terror cases. Instead of using article 245 of the Constitution, to formulate parallel justice systems why can’t the armed forces aid civil justice system by providing security to judges and witnesses under the same article? @author – your claim that sunni Muslim men are joining ISIS because they are unemployed. You go to University of Oxford !!!! Can you please cite your claim. I have one question for you why are they unemployed in the UK ? In usa I don’t see unemployment among the impressionable Muslim youth. I am incredibly sorry in the delay in getting back to your comments, and am thankful for the feedback. Initially, I do not believe that the piece promotes terrorism at all, but it colours an otherwise bias narrative that does not highlight the pressures faced by Muslims in European/Western societies, as well as elsewhere. The recent attacks in Paris where twelve people tragically lost their lives was met with anti-Muslim backlash that has become somewhat familiar in Europe today. There was the hashtag #killallMuslims that was trending as well as rise in anti-Muslim attacks in Paris, which can parallel those that happened after Lee Rigby was murdered. Furthermore, for those of you who have friends in Europe, particularly Britain who do not feel such sentiments than I am thankful that they do not, but the extent to which they, or even my piece is representative of the majority is questionable.